This module teaches a method for evaluating the scalability of parallel programs. 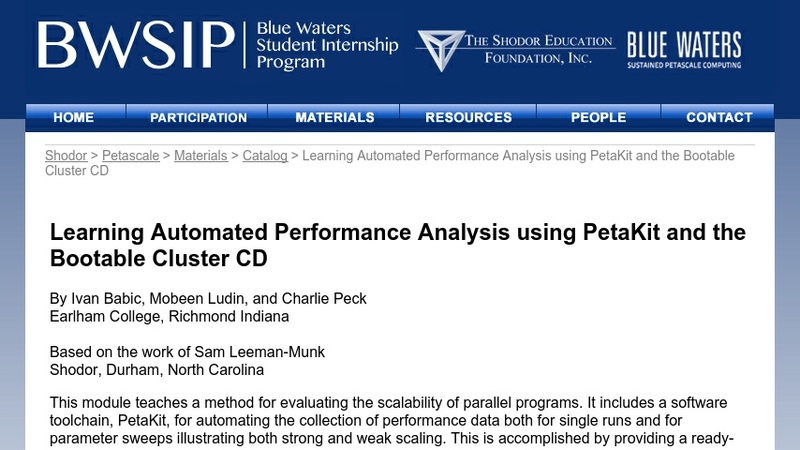 It includes a software toolchain, PetaKit, for automating the collection of performance data both for single runs and for parameter sweeps illustrating both strong and weak scaling. This is accomplished by providing a ready-to-run parallel and distributed operating environment, the Bootable Cluster CD (BCCD), with a variety of parallel programs which are already instrumented with PetaKit. The PetaKit software is also provided independently as part of the BCCD so that it can be incorporated into the student's own programs, either running under the BCCD or on any other Unix platform. This combination supports exploration of Speedup, Efficiency, Scaling (strong and weak), Amdahl's law, Gustafson-Barsis law, and the Karp-Flatt metric.